This is going to be a big day for me. Today I was going to say goodbye, not only to my current hosts, not only to Townsville (again), but also to the Australian east coast that I have been travelling the last three months. Ramon goes into the Australian Outback! When Scott woke me up, I already smelled the nice flavours of bacon and eggs. In the kitchen Sharyn Brown was enthusiastically preparing a full breakfast for me. She knew I was going to make a long distance trip today and even though it was 6am, she stood there cooking with a big smile. After breakfast I said goodbye to Scott, who had to start his job as a renderer, and Sharyn and the kids brought me up to the bus terminal in Townsville. On the road to that place, Sharyn made a few stops to pack my bags up with something to eat and to drink for on the road and she even gave me a 20-dollar note!! No, I wouldn't starve or die of thirst; I had Sharyn's help! But I was on Flinders Highway heading up to the West! From Charters Towers the trip basically began for me. From here on things got very different than I have seen the last couple of months. It was really getting dry out here. The only thing I saw for more than hundreds and hundreds of kilometres where dry bush fields. Every time the bus made a stop, we had ended up in some small town with the bus parked on the main street. The town would exist out of three blocks of houses from the main street and the same on the other side. And it was hot! And it was dusty. I had to drink one bottle of water every time (and use the toilet every time). Fortunately the bus had air conditioning and entertained the passengers with a movie after every big stop. One main stop, in a town called Hughenden, the bus bumped into some mechanical problem. While opening the luggage door of one of the compartments on the bus, the door fell off. Believe me, it's not something you want to have falling on your feet! The bus driver was an Aussie and understood pretty well that he couldn't fix this door at this spot. He broke the entire door off the bus, got the entire luggage into another compartment and threw the broken door in the open compartment. With some wires the thing should be okay there. "Let's go again, everybody!" His work on the bus gave me a few extra minutes to have a walk through Hughenden, the place that became world famous for one of the first findings of dinosaurs remains. 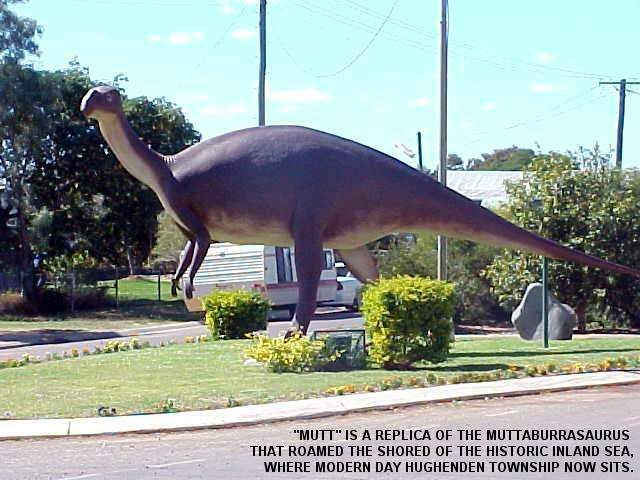 A replica of a bird-footed dinosaur, a seven-metre long fellow nicknamed Hughie, was standing on a street corner. From Hughenden the bus drove on again, with its open door, and another movie was played. After a simple Steve Martin flick, this time something started about Vietnam and the war and it had loads of elephants involved in it. That's all I could understand all the way from the back of the bus, where I was located at the sunny (hot hot hot!) side of the bus. Another stop made me jump out of the bus in Julia Creek, another small town, but now on just a few hours driving away from my destination of today. In my eyes, Julia Creek is just another major hub in the northwest Queensland stock and sale centre. It is also the home of the Julia Creek Dunnart, which is only found in this area and nowhere else in the world. Whatever was there looked over 50 years old and had survived decades of toaster wars. A sign along the road told me that the average amount of rainfall in Julia Creek is 463 mm. Per year! "Let's go again, everybody!" 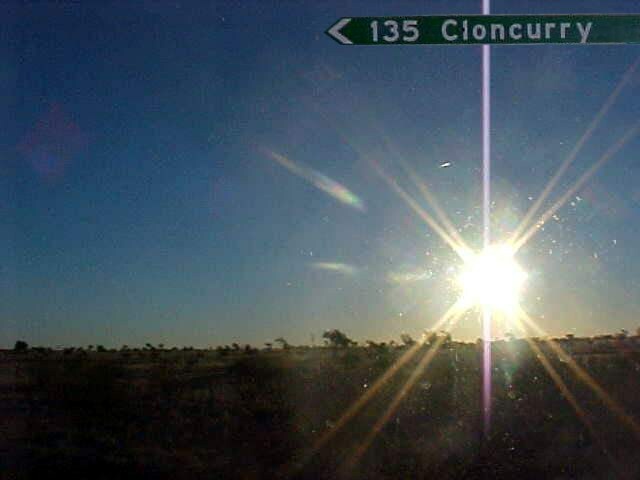 It took another two hours to get to Cloncurry, my destination. I enjoyed watching the movie Legend of Bagger Vance with Will Smith on the video (about a down-and-out golfer who attempts to recover his game and his life with help from a mystical caddy) (I found myself some empty seats in the front). There wasn't much else to see outside. Of course every now and then I caught myself staring out of the window, at the red dirt along the road, the yellow bush and various rock and hill formations in the background. That was all. The bus arrived in Cloncurry just after sunset, with one hour delay, and I was dropped on the main street of this colourful frontier mining town � noted for having Australia's highest temperature in 1889 (53.1 degrees Celsius) and it's the birthplace of the Royal Flying Doctor Service. Cloncurry owns its name to Robert O'Hara Burke, together with William John Wills one of the first men to cross Australia from south to north. But it probably owes its existence not to that explorer who passed through in 1861 during his ill-fated trip to the Gulf of Carpentaria, but to a man who was looking for grazing land but found copper instead. It was in May 1867 when Ernest Henry discovered copper. He became the founder of the town and the vast mineral wealth of the district. 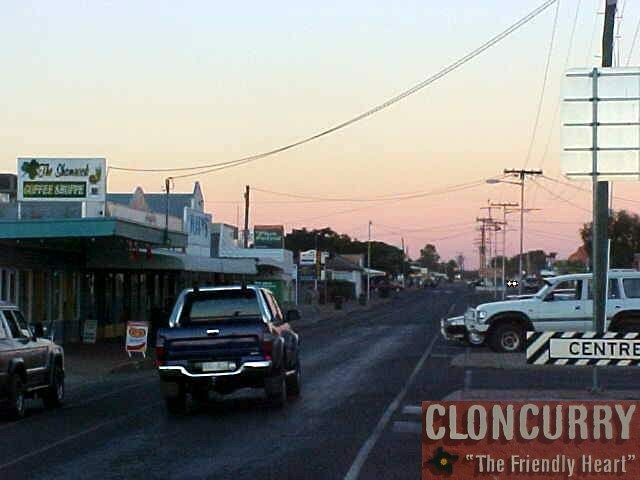 He named the area the Great Australia, but when the town was surveyed in 1876 it was named Cloncurry, after the Cloncurry River, which that O'Hara Burke had named for his cousin, Lady Elizabeth Cloncurry of County Galway in Ireland. And what a coincidence that is: I have been to Galway! I contacted Annette Chappell, the lady who had invited me to stay for a day at her place in this town (as the only person in the Australian outback!). When I called her last week, she was stunned. She had heard about me through her sister in Canada and decided to send her invite to me. 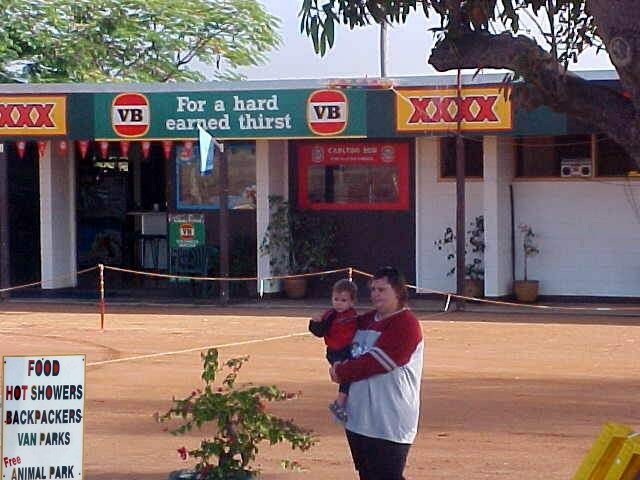 Ramon would never come to Cloncurry, she thought. Oops. And I came on a good date, probably the best time of the year. This weekend the Annual Cloncurry Show was on, a big festival in town where the entire town and all its citizens gather together to show their pride and joy. However, Annette's husband Alan was a little aback when he heard about me coming over. Annette already had her parents coming over for this weekend and that would just become a bit too much. But no worries, Annette called up a friend and asked if I could crash at his place for a few days. Yes, I could! So when Annette picked me up of the main street of Cloncurry, let me drop my gear at Shawn's place. Shawn is the manager of the Queensland Bulk Haulage road train company, where Annette works as an administrational help and where Alan Chappell is an all-round mechanic. From his house we went to the pub, where Annette introduced me to Shawn. "Heya mate! If that ain't our bloody world traveller, ay!" and he pushed me a beer in my hands. Annette had to go again, taking care of that big family at home, but she would pick me up tomorrow morning and take me to the show. "Have fun tonight!" she said when she left. There I was in some quiet restaurant/pub/motel/hotel along the road with Shawn, who told me he has been drinking all day already. I met up with his colleague Trevor, a manager from another company, and was introduced to the Outback life. And thus also to the language. The Australians living here swallow half the words of a phrase, spit in the words 'bloody' and 'f*cking' wherever possible and say whatever they say very fast. So you can understand I first got bloody tired of all these f*cking new things I was learning, but also got the hang of it a bit later, with the joy of another few cold beers. Shawn treated me to a good rump steak dinner at this place where we were (please know that 'medium-rare' means 'black-flaked' in this part of the world) and joined some of his trucker friends. Here I learned everything I didn't know yet about their little bastards as how they call their road train trucks. I now know a lot more about cattle, transport and mechanical problems than ever before. I had a good laugh when one of those friends asked me how we move cattle in The Netherlands. Move cattle? "We don't have to move it!" "But what if you run out of grass?" I hope I really opened up their mind about my little home country in Europe, because you just can't think the same way about space as in Australia. After this dinner Shawn took me down to the Post Office Hotel, the party place for the locals of Cloncurry. And what a different world this is. A band was playing in the beer garden and all kinds of folks were drinking and moving some of their hips on the beats of the drum. Big light spots lit up the garden, making everybody stand in the shade and near the bar. I lost track of counting the cowboy heads these men and ladies were wearing, I almost fell an outcast here. And of course I tried to make some chats with the locals. And I must tell you, that is a hard thing to do when you are not from around here. Conversations have rules: you talk about trucks and sheilas (Australian women) and whatever you can do with them. Anything else is out of the question, so there was my outcast feeling again. I didn't do well enough with the trucks and the boys then didn't even want to know about my life with no sheila (like anybody would!). Another thing that took place here, was the toughness. Half-bearded 18-year-olds would wrestle each other to get attention from their sheilas. And they weren't so successful, because the ladies all knitted together in a corner, discussing what the price of fuel is costing lately. Per litre. I found out, because I just walked up to them and started a conversation. I finally bailed out because I couldn't join their conversation as didn't know anything about the latest prices for fuel. Tough ladies! I left the area around midnight, feeling pretty tired of this long day and I didn't really felt that comfortable to this party place � yet. Give me a few days and I might.